History of electrical wire & electrical wiring: how to recognize knob and tube electrical wiring and unsafe "extension cord" wiring. How to evaluate the number of electrical circuits in an older home. Photo guide to types of old building electrical wires. 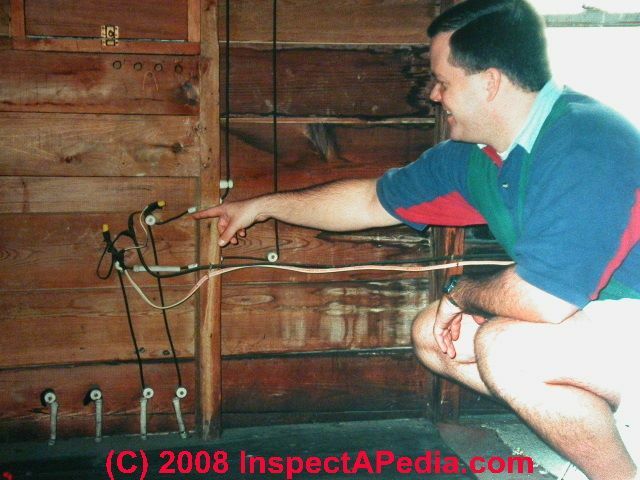 These photos help identify types, condition, & hazards of old electrical wiring in buildings. 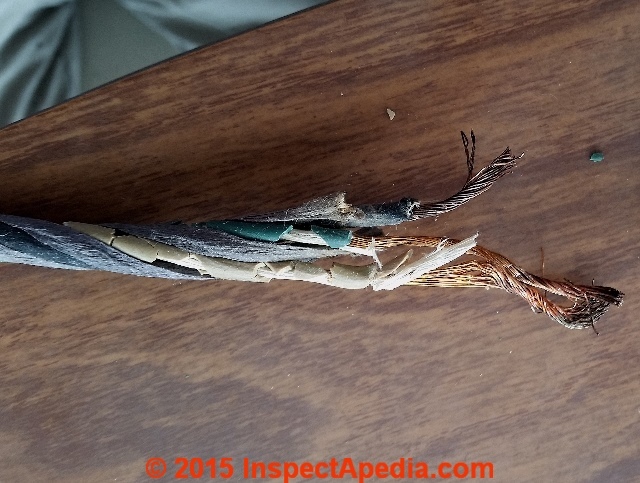 In this article series we list common old building electrical wiring system safety concerns and we illustrate types of old electrical wires and devices. This article series answers basic questions about assessing and repairing the electrical service, capacity, wiring type, condition, and safety in older homes. "So much has been said and written upon the subject of high-tension electric currents and their probable or possible danger to human life, and so many different opinions have been advanced by men whose positions serve to surround their utterances with an atmosphere of knowledge of the matter under discussion, that the mind of an unscientific public has been unable to come to any definite conclusion upon the basis of "expert" testimony. These rusty looking "pipes" may be the last remnants of the oldest and original electrical wiring used for underground electrical power distribution in the U.S. We describe these electrical power cables and provide images of and links to early electrical wiring and wire insulation methods in this article. While varying somewhat by area of the country in the U.S., Latin America, Europe, and other areas, there are recognizable generations of electrical wiring ( KNOB & TUBE, greenfield, armored cable or " BX" wiring, plastic or " NM/NMC" wiring), wiring materials (copper, tinned copper, aluminum, copper-plated aluminum). Proper identification of the type of electrical wire and wire insulation is useful for those seeking to guess at the age of a building or of its electrical system, and in some instances it is helpful in assessing the condition and safety of the building wiring system, such as taking note of the presence of branch circuit solid conductor aluminum electrical wire that has not been properly repaired - a fire hazard. A 1980 US CPSC study found that aging electrical systems are a factor in the occurrence of electrical fires in homes, an observation confirmed separately by Aronstein in explaining aluminum wiring hazards in what Aronstein calls the "bathtub curve" that maps failure rates over time. at ALUMINUM WIRING SAFETY ASSESSMENT. But Dini points out that "... most of the hazardous conditions found in the 30 houses [studied] could be attributed to a lack of compliance with a specific code requirement". (Dini 2008). Above: two types of branch circuit electrical wire insulation are shown in our photo: braided fabric wire insulation, probably cotton covered with wax or varnish, and newer plastic wire insulation. The braided fabric wire insulation was found on a 1960's fluorescent light ballast, while the plastic wire was used in the branch circuit wiring for the light where that ballast was employed. The old style ballast and its wire could have dated from the 1950's. 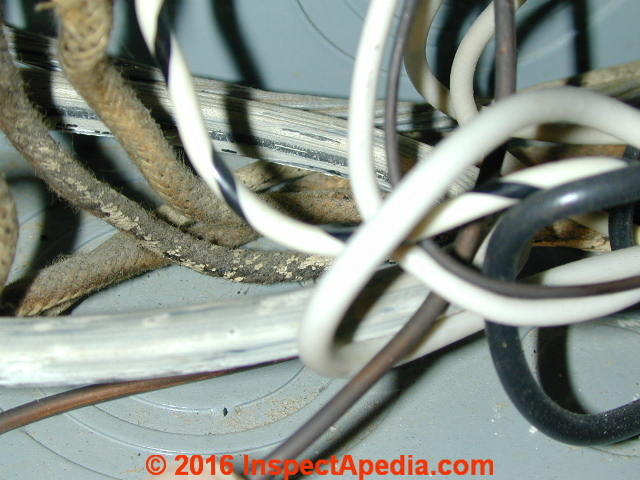 As you see in the photo above, typically aluminum electrical branch circuit wiring was plastic-covered. Aluminum wiring has been studied since about 1945, and began appearing in homes in North American as early as 1965. In that year Kaiser Aluminum and Chemical Corporation (KACC) began marketing KA-FLEX solid-conductor aluminum wiring (shown here). Unless it has been properly repaired or replaced, aluminum wiring in homes or other buildings is a serious fire hazard. 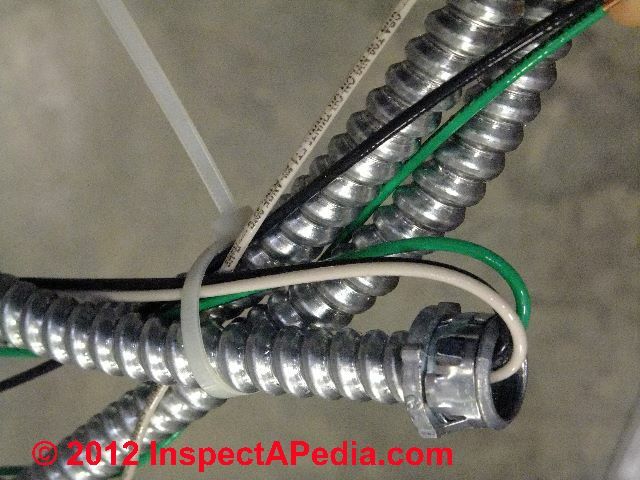 Or see ALUMINUM WIRING GUIDE for HOME INSPECTORS for a discussion of safety hazards associated with aluminum wiring. Watch out: improper "repair" of aluminum wiring using connectors that do not successfully prevent overheating (CO/ALR, CU-AL-stamped devices, and the Ideal No. 65 purple Twister), may increase the fire hazard in a home and worse, may lead occupants to ignore danger signs of a possible fire, thinking that their wiring is now repaired and safe. 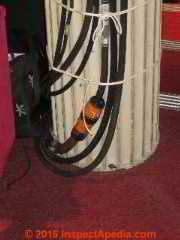 The photo above illustrates two generations of metallic-sheathed armored cable or "BX" electrical wire. The larger diameter wider-wrapped armored cable is probably Greenfield flexible steel armored cable, a wiring type patented in 1898. Where does "BX" come from? Dini (2006) explains that this cable was produced by Greenfield, one of its inventors, in two experimental forms AX and BX (X = experimental). The second version "B" was the more successful version that was produced. 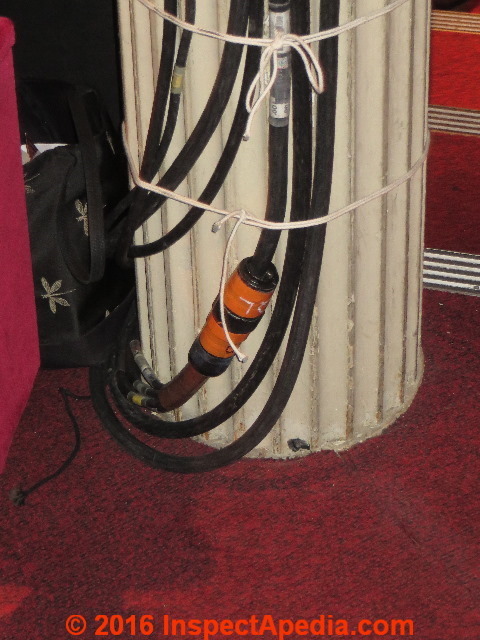 The term "BX" stuck on later versions of flexible metal armored cable: the smaller-diameter modern "BX" wire is in the left of the photo and connects to the left side of the electrical box. see ELECTRICAL WIRE STRIPPING TIPS where we discuss stripping and working with BX or armored cable. at STEAM BOILERS GENERATORS CONTROLS, PRATT. fourth, to provide a lead or equivalent covered cable with a flexible protecting armor which will protect the lead covering from the action of metal slivers when drawn into a conduit. 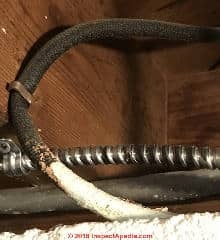 CONDUIT WIRE IDENTIFICATION in this article. 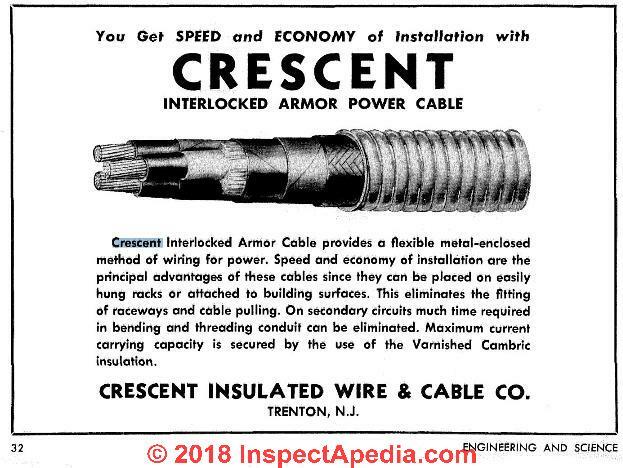 Crescent Insulated Wire & Cable Co. also made fabric-insulated electrical wire described further at FABRIC NMC WIRE INSULATION IDENTIFICATION. at ASBESTOS ELECTRICAL WIRE INSULATION. 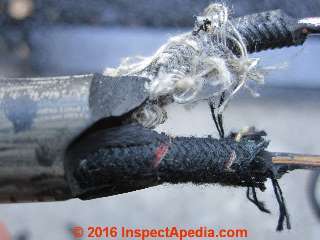 Asbestos electrical wire insulation is reported by some websites as "common" but I suspect its use was most-common in applications where extra heat resistance and fire safety were a concern, such as theater wiring, electrical appliance wiring, aircraft wiring. More examples of non-asbestos wire loom are given later in this article. Above: varnished-cloth electrical wire on the ballast used in a fluorescent light fixture in a 1960's home built in northern Minnesota. Metal and more recently plastic tubing are both used as conduit for routing and protecting electrical wiring in a wide range of applications. 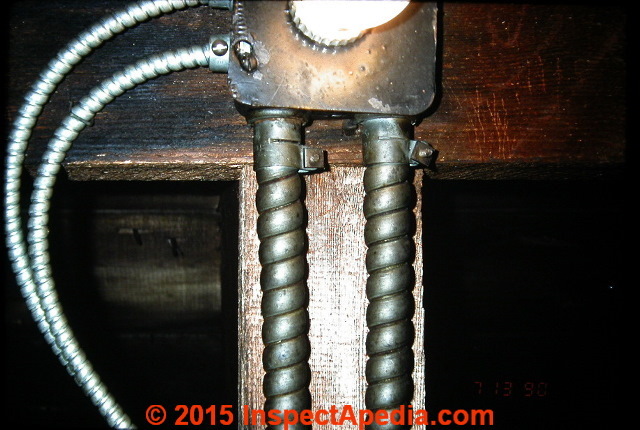 Dini (2006) notes that the earliest wire conduit material (ca 1910) was made of wood moldings grooved to carry the conductors and covered with a wooden cap. But you won't find that material today except perhaps in an authentic or un-restored older building. Modern conduit is made of rigid metal that can be bent into elbows, plastic that includes pre-bent elbows, and flexible metal and plastic ENT materials. 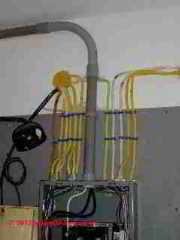 Below you will notice large diameter plastic conduit bringing power to an electrical sub panel. Electrical conduit is also sold in a flexible metal design that should not be confused with BX or Greenfield armored cable: this flexible metal conduit looks like BX or armored cable but is sold "empty". Below this section of flexible metal conduit was a left-over scrap that had had three wires inserted through the protective cable. see ARMORED CABLE or BX WIRE IDENTIFICATION in this article. 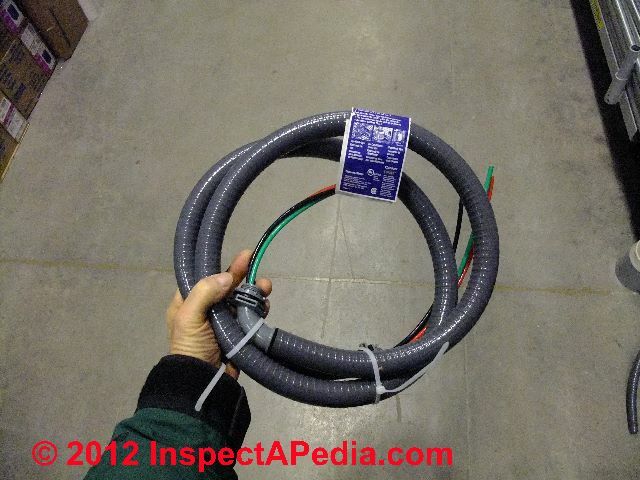 In nearly all new outdoor air conditioner & heat pump installations the electrician uses a pre-wired waterproof electrical conduit whip (photo above). ELECTRICAL CONDUIT, METALLIC where we describe just about all of the types of modern electrical conduit materials including some not shown above. 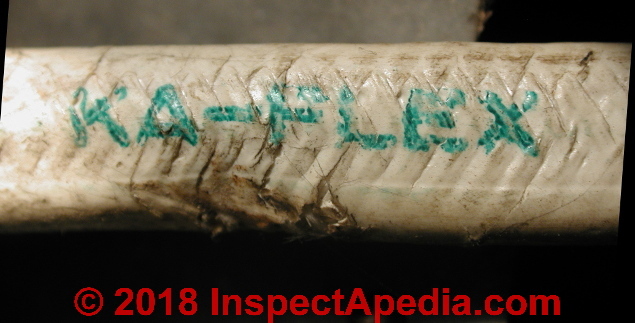 The photograph of copper-clad aluminum electrical wire shows the wiring sheathing markings [click to enlarge]. This NMC or non-metallic-sheathed cable electrical wire was observed in a 1974 Edina MN townhouse and was connected to an FPE electrical panel. Unlike aluminum electrical wire used in branch circuits (a fire hazard), copper-clad aluminum wire performs about as well as copper wire and is considered safe for use in homes provided of course that the wiring has been correctly installed. Photograph above provided by and used with permission of Roger Hankey, a Minnesota home inspector. at NUMBER of CIRCUITS in OLD BUILDINGS, use of zip cord or extension cord mounted on or through walls and ceilings to add lighting circuits or receptacles is improper, unsafe (a fire hazard), and is often an indication that the building does not have enough circuits for modern usage. 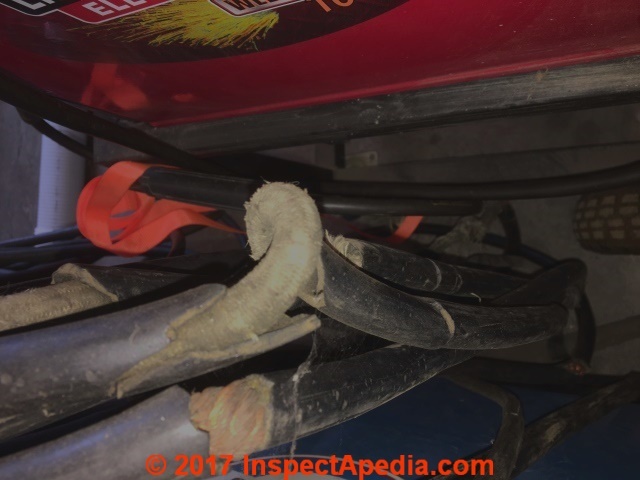 Watch out: where we find zip cord electrical wiring it is important to see what other unsafe wiring practices that same installer may have followed. No cover plate on the electrical box. 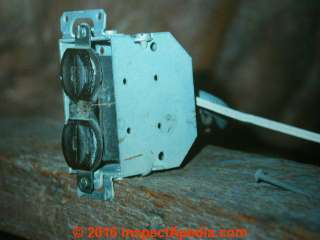 Below we show the front of this add-on electrical receptacle. 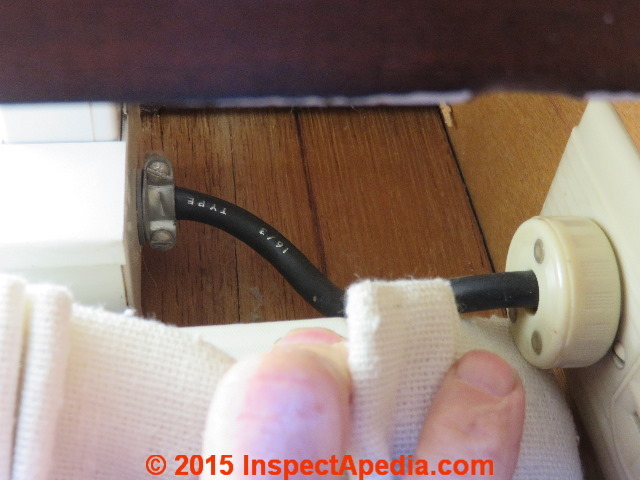 One thing is "correct" though: the installer used a two-prong receptacle that excludes a third ground prong opening - as he should have done as the circuit does not include a grounding conductor. The exterior insulation on cloth or fabric-insulated NMC electrical wires are often black, silver, or white but may also be black or brown. The individual conductors within the cable may be insulated in rubber or fabric-covered rubber or they may be insulated by plastic in later wiring products. See details includeing the history of manufacturers of fabric-insulated wire along with dates, trademarks, and identifying photographs of a number of these cloth-insulated wire types. 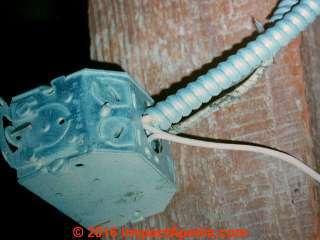 Also see ASBESTOS ELECTRICAL WIRE INSULATION. 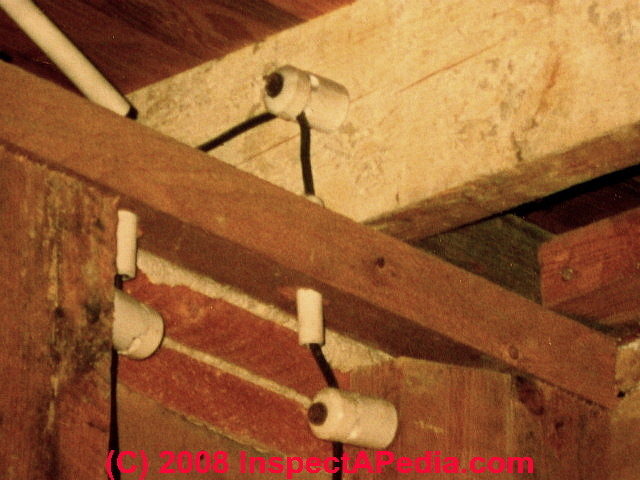 The earliest form of electrical wiring system in buildings in the U.S. was knob and tube: separate hot and neutral wires were hung in air, spaced 2 1/2" or more apart, and insulated from contact with wood framing by ceramic knobs or where wire had to pass through a wood framing member, ceramic tubes. Both of these are shown in our photo below. 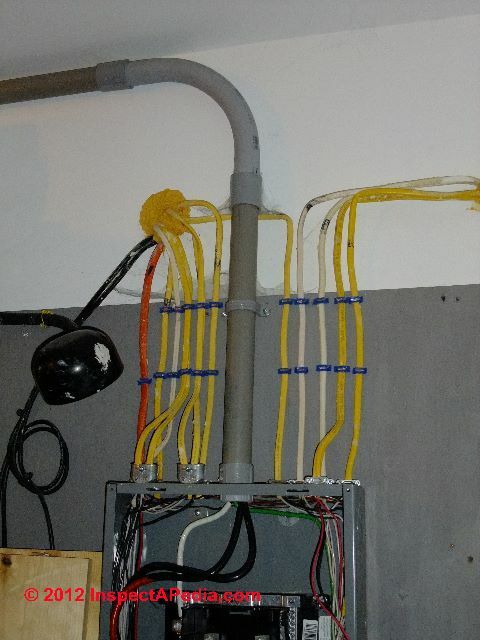 Knob and tube wiring diminished in popularity in North America by 1940, but continued to be installed as new work in some locations (including New York) until about 1975. This wiring as pre-existing or "old-work" electrical wiring, is still described in the U.S. National Electrical Code (2005) in Article 394.
at KNOB & TUBE WIRING - home, where we discuss assessing the condition of knob and tube wiring and issues concerning improper extensions of knob and tube circuits. Dini (2006) notes that NMC or plastic-insulated wire or "Romex" has been in use in the U.S. since about 1926. Plastic NMC began replacing both rubber wire insulation and fabric-based wire insulation in the U.S. in the 1950's. PVC here refers to plastics based on polyvinyl chloride. 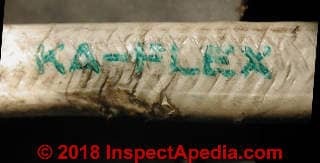 Plastic or thermoplastic nonmetallic cable such asa that shown below, still referred to by many electricians as "Romex" cable, has been in use since the 1960's and in the U.S. became very widely used in new residential construction by 1970, completely replacing fabric-based wire insulation products. See FABRIC NMC WIRE INSULATION IDENTIFICATION. (ARMORED CABLE or BX WIRE IDENTIFICATION) or electrical conduit rather than plastic NMC. The object of my invention is to effectively insulate wire, so that it will be waterproof and capable of being used in moist places and even under water without detriment to its insulating qualities, and also fire-proof, so that if by accident the wire becomes red-hot the insulating-covering will not be set on fire and burned, but only oxidation will result, which will leave the wire pyro-insulated. The main feature of the invention is the use as an insulating-covering of a mixture of rubber with an infusible material in the form of a powder. But actually earlier electrical power cable and wiring insulation appeared as rope, tarred fabric, and even wood. However the rubber insulated wire illustrated by Edison's 1892 patent represented the first economical branch circuit conductor wire insulation approach that could be mechanically and economically produced in high volume. 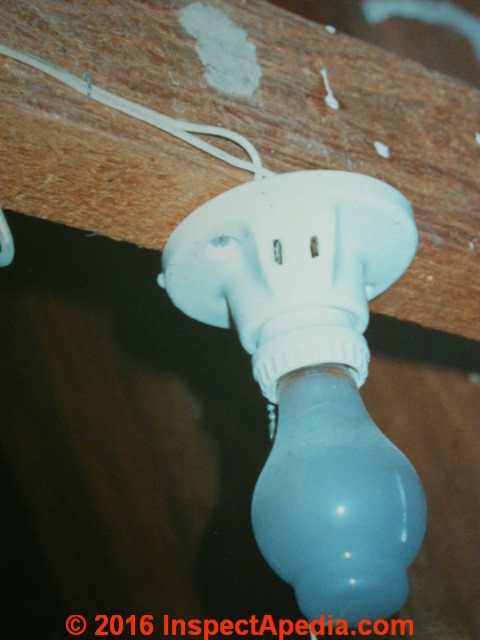 Above: This wire was a short section of extension cord that had been used to connect a permanently-mounted fluorescent light fixture to power by plugging it into a wall-mounted electrical receptacle. 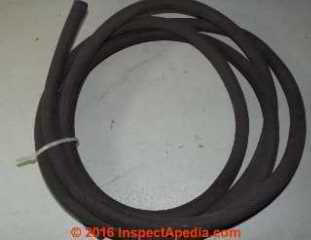 Below: this is a sample of plastic-insulated multi-strand electrical wire that was encased in the rubber jacket shown above. When the light failed to operate the author, on disassembly, found that the insulation on this wire was badly deteriorated, crumbling, and unsafe. In our rubber and fabric wire insulation photo below you can see that inside the outer rubber wire jacket these conductors were insulated by fabric-covered rubber. The color codes (white = neutral, black = hot) can be faded and hard to recognize on these wires unless you strip back more of the insulating jacket. 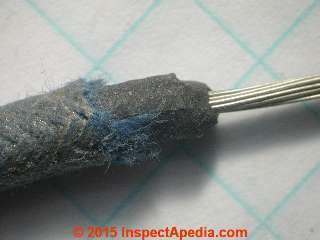 The wire shown below combines the hot and neutral wires in an external rubber jacket. But the earliest electrical wiring systems in the U.S. used the knob and tube system. 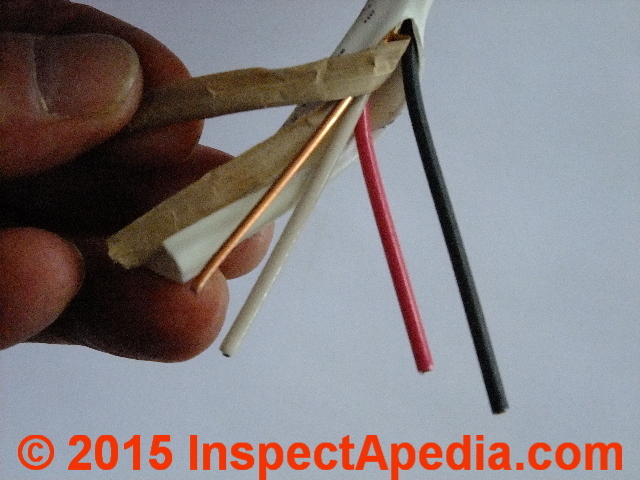 Sometimes you may find tinned-copper electrical wire in these older conductors. Don't mistake tinned-copper for aluminum electrical wiring. 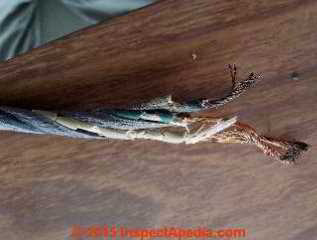 The damaged power cable shown above was used with a 1970's electric welder. 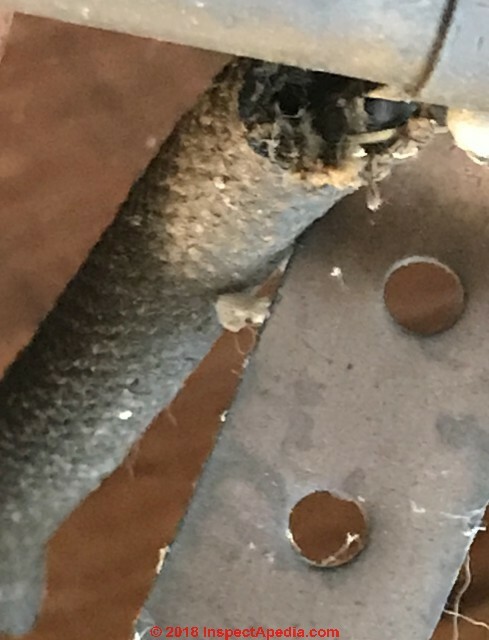 Beneath the heavy rubber exterior of the welder power cable we see a cloth fabric that might be an asbestos fabric needed for extra heat resistance. 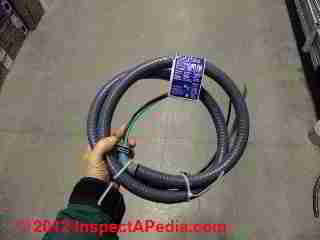 Other readers familiar with this welder cable are invited to use the page top or bottom CONTACT link to offer more information. Above: Above we're looking at the cut-end of what is most likely a section of original DC or continuous current distribution cabling salvaged from a NYC trench. The solid copper core was wrapped in rope to insulate it from the iron pipe and the space between that cable and the surrounding iron pipe was filled with a pitch-like substance. - C.M. 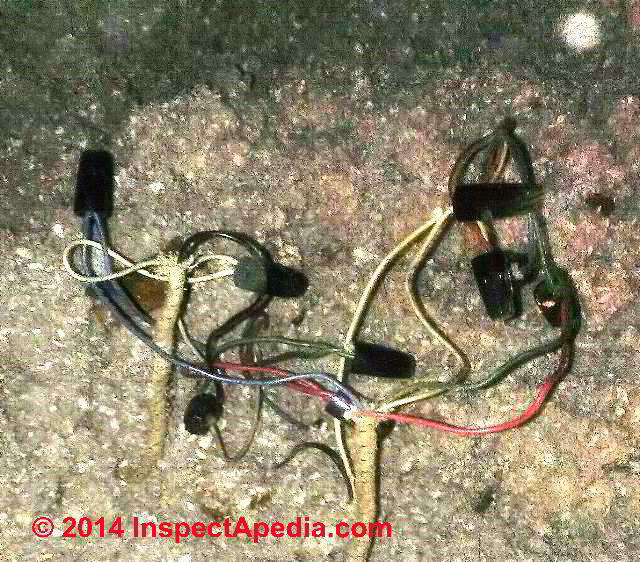 In theaters where electrical wiring is often temporary, we often find surprising and possibly unsafe installations. The rubber-coated wires shown below were observed in a New York theatre and looked better than what my brother-in-law Matt, a theatre electrician, could produce. Theater fires are particularly dangerous as there is likely to be a crowd stampede to exits, poor lighting, and lots of combustible materials. In my home town, Richmond VA, the Hippodrome theater, opened in 1914, caught fire in 1945 when I was just two (so I'm not responsible). The fire was thought to have been electrical in origin. The U.S. NEC addresses theater wiring in several articles such as Article 530 - buildings or portions thereof used as studios using motion picture film or electronic tape more than 7/8" in width, Article 540 - wiring for motion picture projector rooms, and others. 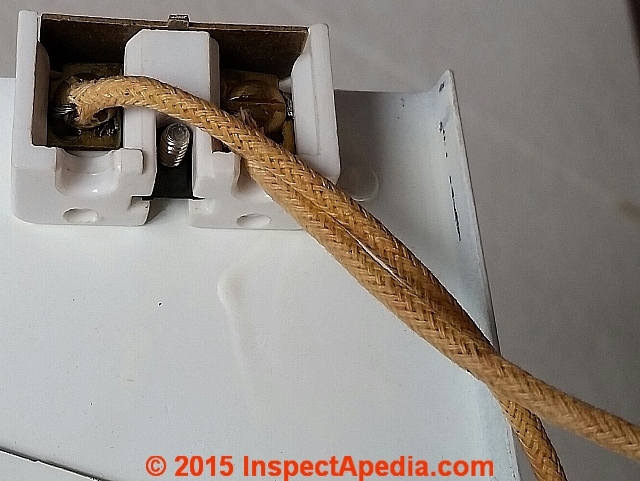 Older homes often have electrical receptacles and fixtures that are ungrounded, and many local codes do not require that they be rewired so they're grounded. Still, grounding is worth adding to your system because it adds protection against electrical shock. Above we see both older fabric-covered electrical conductors and newer plastic-insulated wires in an electrical panel. The bare copper wire that is nearly black was a clue in tracking down a neutral and ground wiring failure at this building. Above the same rubber-insulated electrical wire discussed earlier is also used to illustrate the dull silvery colored metal wire observed where tinned copper electrical wiring is installed. Watch out: tin-plated copper wire is a completely different product that, because its conductors sport a thin plated silver colored surface, might be mistaken for unsafe aluminum wire. It is not aluminum and it is safe unless, as with any electrical wiring, it has been damaged in some manner. Not all rubber insulated copper wire is plated, but if you suspect that the silvery-colored wire is plated copper, it's easy enough to determine: with the wire disconnected from any power source, scratch the silver colored surface of the rubber-insulated wire and you'll see its red copper interior. Plated copper wire [tinned copper wire] is relatively common in older homes, and it looks like aluminum wire. It was commonly used with rubber-based insulation. Identification can be made by careful inspection of a cut end of the wire. At TINNED COPPER ELECTRICAL WIRE we provide additional discussion of how to avoid confusing tinned copper wire or tin-plated wire with aluminum wire such as the tinned copper multi-stranded wire shown below. The heavy fabric braid wires shown in the left of this photo may be mistaken for Wireduct, also referred to as All-Weather Loom - shown below. It is not. This is a fabric- and rubber-insulated multi-strand electrical wire. Wire-loom or all-weather loom was sold as a non-metallic flexible conduit for protection of electrical wiring in buildings. Wireduct all-weather loom wire insulation was produced in sizes from 1/4" to 2 1/2" in diameter and was described as having a flame-retardant finish and low moisture absorption. The two wire loom fabric-conduit photos above were provided by InspectApedia.com reader Jared. The asbestos "wireloom" shown earlier on this page may be an example of this product too, designed for improved flame resistance in theaters. You may find wireduct or wire-loom on knob and tube electrical wiring systems as well as other older building electrical wiring. 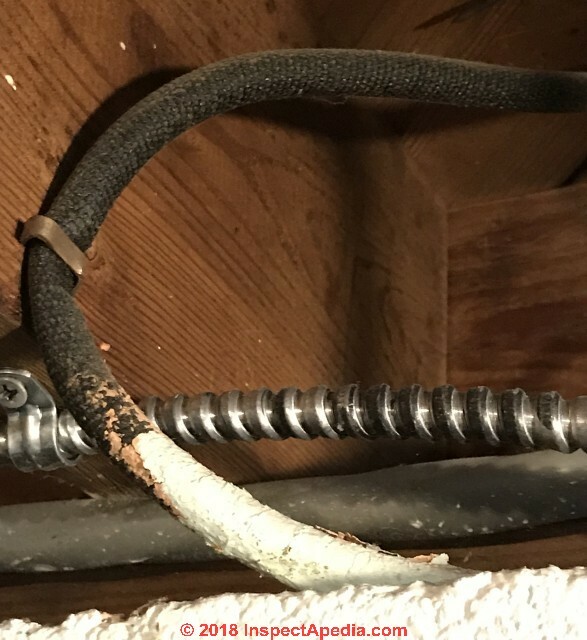 In the unfortunate electrical wiring situation shown above, a reader mailed us this photo of white (probably-asbestos) wire loom-wrapped electrical wires and splices left exposed in the floor of her attic. We caution that with this sort of electrical work visible, one must worry about what other work was done on the building by the same installer. Wire Loom is still sold as a cabling protection sleeve made in its current (2016) form as a colored nylon flexible slit corrugated tubing or as black polyethylene flexible tubing. Below: a non-split wire loom: Whittaker Fabric Wire Loom, 3/8" diameter. 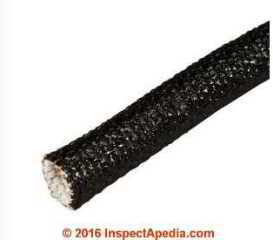 This is an asphalt-impregnated cotton wire loom typically used in automotive applications. Some antique wire loom products or wiring sleeves are constructed with a combination of asphalt-impregnated cotton/poly paper blend coated with asphalt for moisture resistance. Special thanks to Minnesota home inspector Roger Hankey for assistance with material for this article. Roger Hankey is principal of Hankey and Brown home inspectors, Eden Prairie, MN. Mr. Hankey is a past chairman of the ASHI Standards Committee. Mr. Hankey has served in other ASHI professional and leadership roles. Contact Roger Hankey at: 952 829-0044 - rhankey@hankeyandbrown.com. Mr. Hankey is a frequent contributor to InspectAPedia.com. Safety Warning: Do not attempt to work on your electrical wiring, switches, or outlets unless you are properly trained and equipped to do so. Electrical components in a building can easily cause an electrical shock, burn, or even death. Even when a hot line switch is off, one terminal on the switch is still connected to the power source. Before doing any work on the switch, the power source must be turned off by set­ting a circuit breaker to OFF or removing a fuse. Question: suspected electrical short circuit increasing electricity usage in an older home? Hello, thank you for the wonderful website, it has been of great help to me for years now. I have a 1974 home in Maine, a ranch with 200 amp breaker box service. I also have power bills around 50% higher than they should be. I have not been able to afford to have the kind of exploratory work done to find the problem, but I did find some thing odd in a wall outlet the other night. It is mid circuit in a metal box in the wood paneling by the brick chimney. The top of the box is clean, but the inside of the bottom has some white corrosion. The lower hot and neutral pair are dark from age but also have green corrosion where they wrap around the terminal screw, but the upper pair do not. I thought water or perhaps mouse urine from the attic, but then the top outside of the box would be corroded too, as would the top pair of hot and neutral wires. A simple circuit tester shows the wiring to be double green correct. Here is the weirdest part, the power strip/protector plugged into he TOP outlet, the blades are clean, but when I unplugged it the ground pin is a corroded mess. At some point the the upper hot must have touched somewhere because there is a bright brass splash in the screw, and it has not darkened over time--it looks polished. Find our email at the page bottom CONTACT link to send me some sharp photos and we can comment further. You can find the energy users in your home quite easily if somewhat subjectively. Stand at the meter and watch the dial spin rate (or time it to be more accurate) or on a digital meter note the number change rate per second or 30 seconds. Start turning off circuits in the home. One or two of them will usually define the main energy users in the home when you see the electric meter spin rate drop significantly. Make a note of what appliances (or in your theory current shorts to ground) that are located on that circuit and you've got a good idea who's using the juice. Typically these are air conditioners, refrigerators, electric heaters. 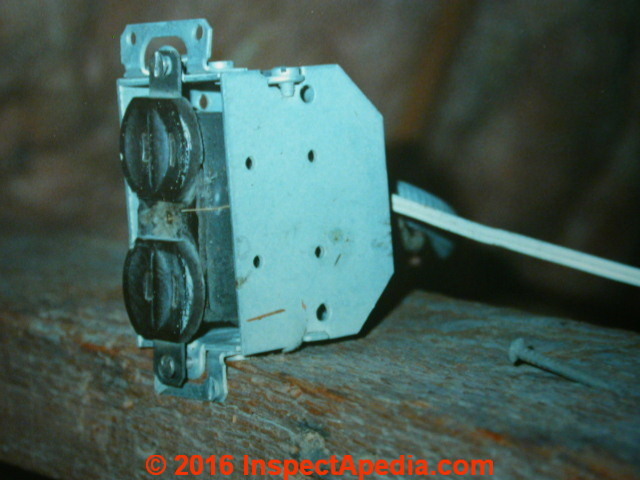 Continue reading at OLD HOUSE ELECTRICAL WIRING or select a topic from closely-related articles below, or see our complete INDEX to RELATED ARTICLES below. OLD ELECTRICAL WIRING TYPES at InspectApedia.com - online encyclopedia of building & environmental inspection, testing, diagnosis, repair, & problem prevention advice. These two papers were presented at the FPRF Aged Electrical Systems Symposium of 2006. These papers on this subject can be downloaded for free. Edison, T.A., "The dangers of electric lighting",. [PDF] The North American Review, 149(396), pp.625-634.1889 RE-published by the University of Northern Iowa, http://www.jstor.org/stable/25101896 and available on JSTOR. Edison, Thomas A. "Manufacture of filaments for incandescent electric lamps." U.S. Patent 470,925, issued March 15, 1892. Edison, Thomas A. "Electric conductor." U.S. Patent 470,924, issued March 15, 1892. Edison, Thomas A. 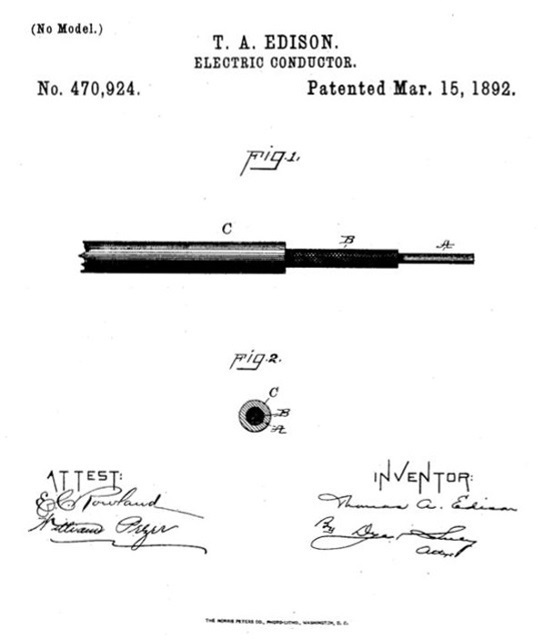 "Electrical Indicator" U.S. Patent 307,031, issued October 21, 1884. Edison, Thomas Alva. "Electric lamp." U.S. Patent 223,898, issued January 27, 1880. 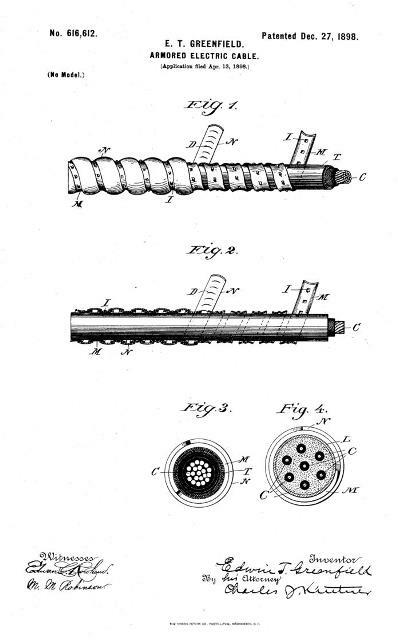 Greenfield, Edwin T. "Armored Electrical Cable" U.S. Patent 616,612, issued December 27, 1898. 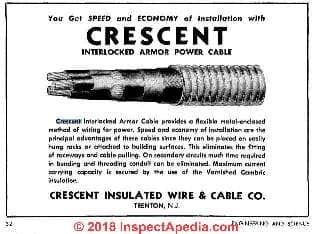 Be it known that I, EDWIN T. GREENFIELD, a citizen of the United States, residing at New York, in the county of New York and State of New York, have made a new and useful Invention in Armored Electric Cables, of which the following is a specification. Hargadon, Andrew B., and Yellowlees Douglas. "When innovations meet institutions: Edison and the design of the electric light." Administrative science quarterly 46, no. 3 (2001): 476-501. This paper considers the role of design, as the emergent arrangement of concrete details that embodies a new idea, in mediating between innovations and established institutional fields as entrepreneurs attempt to introduce change. Analysis of Thomas Edison's system of electric lighting offers insights into how the grounded details of an innovation's design shape its acceptance and ultimate impact. The notion of robust design is introduced to explain how Edison's design strategy enabled his organization to gain acceptance for an innovation that would ultimately displace the existing institutions of the gas industry. By examining the principles through which design allows entrepreneurs to exploit the established institutions while simultaneously retaining the flexibility to displace them, this analysis highlights the value of robust design strategies in innovation efforts, including the phonograph, the online service provider, and the digital video recorder. Hughes, Thomas P. "The electrification of America: the system builders." Technology and Culture 20, no. 1 (1979): 124-161. Hughes, Thomas Parke. "British electrical industry lag: 1882-1888." Technology and Culture 3, no. 1 (1962): 27-44. Norwig, E. A. 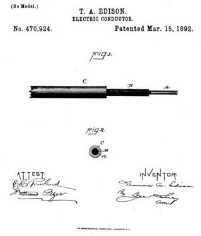 "Patents of Thomas A. Edison, The." J. Pat. Off. Soc'y 36 (1954): 275. Elizabeth Sluder, Montross, VA, a contributor to this article, is a public school teacher who writes basic educational articles about a variety of building, construction, and other topics. Her husband, a licensed electrician, consults for her writing on electrical topics. Her articles appearing at the InspectAPedia TM Website have been edited, illustrated, and on occasion content has been added by the website author. These articles are © 2010 InspectAPedia copyright-protected, all rights reserved. Mullin, Ray, and Phil Simmons. Electrical wiring residential. Nelson Education, 2014. Thanks to our reader Ed (anon) for assistance with technical page editing 03/29/2010.